This Vbarre® workout definitely amps up the cardio! By utilizing additional glide board exercises coupled with body chiseling choreography, Vbarre® Burn turns up the volume on your workout. Come sweat, sculpt, and feel the burn! Veronica Combs is a Regional Director and Master level Teacher Trainer for Power Pilates at Classic Pilates in Dallas, TX. 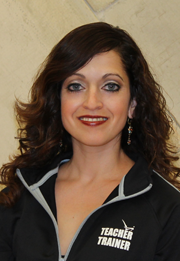 Veronica's passion for wellness and fitness sprang from her desire to dance professionally. Veronica studied classical ballet at the School of American Ballet in New York City, and later at the Kirov Academy in Washington, DC. After graduating with a BFA in Dance from Southern Methodist University, she pursued her career as a Pilates instructor. Her love of movement and dedication to helping her clients reach their fitness goals propelled her to create Vbarre®. Veronica feels fortunate to have a career that allows her the opportunity to help others move better and feel healthier.